We are located on the Cary Parkway, just 6 miles off of the Raleigh 440 Beltline (I-40). Our Cary location is convenient to Apex, Fuquay-Varina, Morrisville, Raleigh, RTP, Wake Forest, Durham, Chapel Hill and the surrounding areas. If you click on “Directions” on the Google map below – you can get personalized directions after filling in your “from location” on the following screen. From I-440/I-40, take US 1 south. Stay on US 1 south for 2 miles, then take the Cary Parkway exit. At the top of the ramp, turn right onto Cary Parkway. Take Cary Parkway 3 miles until you cross the railroad tracks. 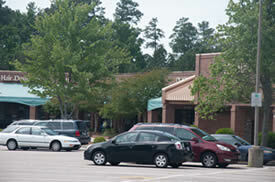 Immediately after the railroad tracks, cross Old Apex Road and then turn right into Parkway Pointe Shopping Plaza. We are located between the Food Lion and Rite Aid Drug Store, immediately beside Subway. I am in the parking lot – where are you??? The trees in front of the building can hide our sign (which says LAPTOPS). We are midway between the RiteAid drugstore and the Food Lion supermarket. What is the deal with the sign? Due to sign size restrictions, Absolute Computers would not fit above our store and so we chose have the sign say LAPTOPS because more than 50% of our business is laptops. The signage rules have changed and we have debated about changing the sign to say Absolute Computers but tradition (and being cheap) has prevented the change. Feel free to provide us with your opinion. So currently the large letters above the awning says LAPTOPS and our name Absolute Computers is only on the glass windows of our store front. Bring along our phone number just in case: (919) 468-3999. We are conveniently located to computer users in Apex, Cary, Clayton, Durham, Fuquay-Varina, Garner, Holly Springs, Knightdale, North Raleigh, Wake Forest, Wendell and Zebulon. We also have customers coming from Angier, Chapel Hill, Carrboro, Fayetteville, Fort Bragg, Sanford,Spring Lake and Rocky Mount.